Kids driving you up the wall? 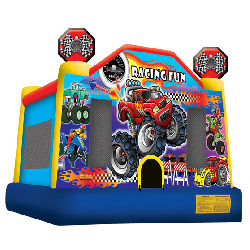 Let them bounce around in this super fun bounce house with cars, motorcycles, and ATVs on it. Kids, start your engines! Parents, kick back and relax. This thing is almost as good as a babysitter. If your kids are into cars, ATVs, and motorcycles, you'll be their hero when you rent this bounce house.